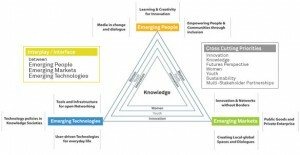 Global Knowledge Partnership and the Global Knowledge Summit are a uniquely Malaysian initiative and offer some interesting views that are all the more valuable for their seeming ignorance of the World Information Summit, which we speculate has lost credibility among those who wish to move more efficiently and purposefully. We speculate that Malaysia, which has also been a pioneer in seeking to establish a global Islamic information sharing and sense-making network, to include an Islamic Press Service, sees itself as the natural leader for the Islamic Caliphate (Extended) in relation to modern information communication technologies (ICT) where it excels. We include this organization and its events in the UN/NGO reference category in part because of the UN representation at GK3 and in part because it appears to be operating with the proper spirit of embracing as many stakeholders as possible for the right reasons.